Take a look at the social media measurement tools that exist, and you're not likely to see many people focusing on the future. Some of the those in the Web Analytics Pantheon and Social Media world create spectacular tools that do a very credible job of looking back, slicing and dicing user behavior in any number of ways. They identify those who influences the conversation. They describe the type of conversations folks have. They map the network a person belongs to. We're blessed to have such interesting tools. I'm not here to compete with that stuff ... you can't compete with it. I'm here to help folks see what the future holds. This, after all, is where all of the actionable strategies happen. Think about it ... you don't care that the weather was sunny and 62 degrees two days ago, you need to plan for the weekend, so you need to know what the weather will be ... not what it was. Take a look at the #measure community, for instance. 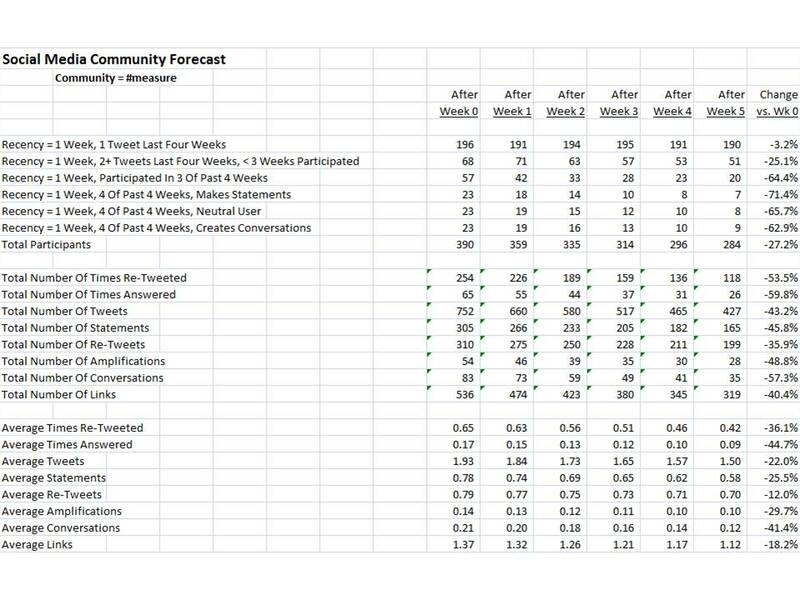 I looked at the community recently, taking data from a prior four week period to forecast the next week, then using the data to create a five week future view of the community. Click on the image below to see the forecast. What you see is a decrease in the level of participation within the community. Now, this does not mean that the community is in decline, not at all. 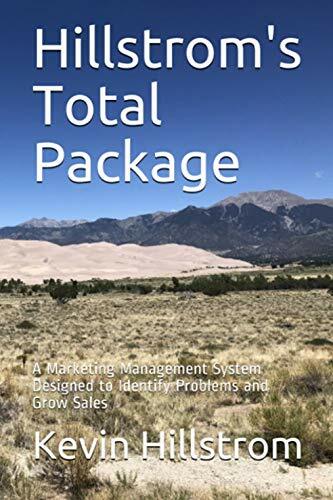 It simply means that for the small time-frame analyzed, the community was less engaged than it needed to be to continue to grow in a healthy way. In fact, because of Christmas / New Year's, the declines were much more significant than this, I had to adjust for the seasonality of Christmas / New Year's. When I run this analysis pre-Thanksgiving, I get a different answer, a more positive answer. When I run this analysis at the end of the month ... well, then we'll truly know where this community is heading. At this time, this is a medium-sized community that is very, very hard to break in to ... with plus/minus sixty folks who have joined the conversation. 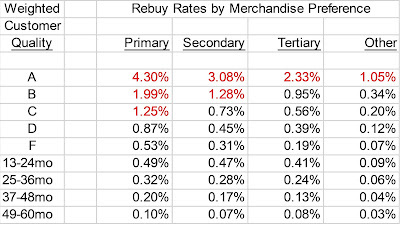 Now, in every e-commerce company, somebody is responsible for forecasting sales for the next twelve months, by day. So it makes logical sense that any community manager would want to know what the future of his/her community is, right? This is something you don't find in any of the popular Twitter-based analytics tools. This is my focus. This is what I love doing, it's completely actionable, and it's an area of analysis not being explored! Next week, we'll do something neat --- we'll remove one important user from the community, and we'll see if the absence of the individual harms or helps the future trajectory of the community. If you are an active participant in the #measure community, please send me a user_id that you'd like to see removed in the forecast ... I'll run an example for the individual who gets the most votes. 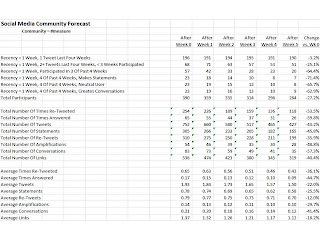 And in two weeks, we'll compare the #measure community to the #analytics community ... competing communities doing similar work ... which community is forecast to have a stronger future? If you agree that forecasting the future health of a community is important, drop me a line or leave a comment. If you want to hire me to create a forecast for your community, contact me. If you want to buy the booklet, called "Hillstrom's Hashtag Analytics", download it via Kindle, or via print from Amazon. Great post, as always! What I find very interesting are the metrics at the bottom of your analysis (and how they could compare to #Analytics) - a community only exists if there is sharing & support, collaboration & respect, as well as reach & opportunities for everyone to join and participate. Your analysis reminds me, in some ways, of Joseph Carrabis excellent blog post when he talked about "the unfulfilled promise of online Analytics".